DETROIT — A Detroit entrepreneur and game developer has launched a new user growth platform for mobile app developers called WildFire. Introduced by Ken Johnson, creator of the card game Phase 10, WildFire provides a new method for app developers, particularly startups and independents, to get noticed in the crowded app marketplace without costly ad-based user acquisition strategies. Through its cross-app virtual currency, WildFire Coins, users get incentives to explore new apps, refer more friends, and engage for longer. As the mobile development and publishing market has become more and more crowded – with more than 2 million apps currently available on the Apple App Store and 3.8 million available on the Google Play Store – user acquisition costs have also skyrocketed, growing nearly 30 percent year-over-year, according to AppsFlyer. This is especially poignant within the mobile games space, which accounted for nearly 80 percent of the app releases in 2017. WildFire says its platform provides an economical solution for user acquisition through its network of apps and associated cross-app virtual currency, which also supports app discovery, user engagement, and loyalty. 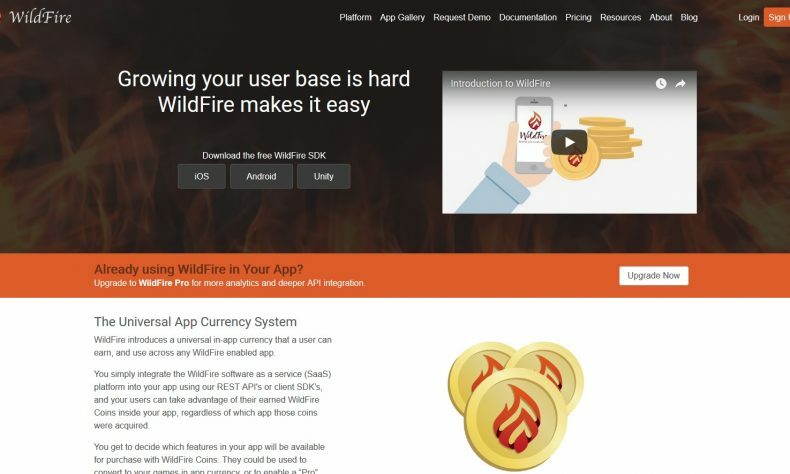 WildFire is launching following more than a year of development focused on refining the application program interface and building the infrastructure for the App Gallery, WildFire’s consumer-facing hub of apps. Today’s announcement also marks the launch of an open beta program centered around the App Gallery, intended to scale the network and ensure the community of WildFire enabled apps can help refine the consumer experience. While mobile developers of all kinds are encouraged to participate, the program will place a special emphasis on the indie game developers that experience some of the industry’s highest user acquisition costs. Open beta participants will join other games that have already integrated WildFire such as Stake Your Stash, Pirate Bubble – Macaw Rescue, and squares2. * Cross-App Virtual Currency: Users earn WildFire Coins by referring apps within the WildFire network, encouraging continued engagement and ongoing referral actions. WildFire Coins can then be redeemed for rewards within any WildFire enabled app. * App Gallery: Built into every WildFire enabled app, the gallery supports developers in app discovery by providing potential users with a hub to find and engage with new apps. Developers can also utilize WildFire Coins within the gallery to improve app ranking and discoverability. * Easy Integration: WildFire’s patent-pending technology is easily integrated into any app via an iOS, Android, or Unity SDK and is free for many developers, meaning even indie developers can efficiently tap into the benefits of WildFire. * Rich Analytics: A dashboard of growth analytics shows how users are referring apps. Additional analytics support showcases app usage data, meaning developers can turn to WildFire for basic analytics needs in addition to WildFire-specific data. * Complete Control: Developers retain control of how to best integrate WildFire into apps. Beyond rewarding referrals, WildFire Coins can be used to encourage engagement by adding rewards to in-app actions such as completing levels in a game, completing loyalty-base tasks, or using an app for a consecutive number of days. EyeWyre is one of the first developers to adopt WildFire for its mobile game squares2, coming soon to iOS and Android. Including its owned apps and those developed on behalf of clients, the mobile developer has brought more than 200 apps to market – ranging from games to consumer apps to industrial interfacing, and everything in between. Mobile developers interested in joining the WildFire network can learn more at www.wildfire.software.